HOW TO RESTORE LEATHER JACKETS? 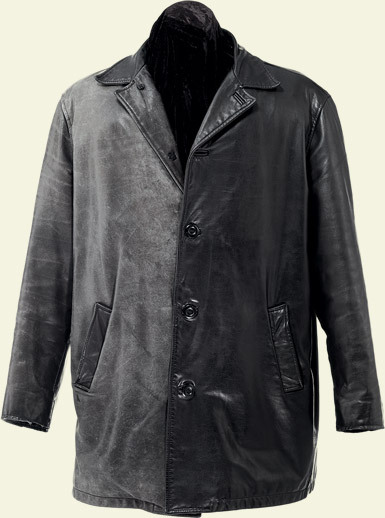 Most leather jackets are made of lambskin; very soft and supple leather that could also be said to be “porous”. There is no protective coating to prevent the dye and restoration ingredients from penetrating deep into the leather. This is why the restoration method below works so well for the vast majority of leather jackets! Also, dark colors are easier to restore. In other words, the color restoration of black lamb skin jackets is the most common restoration project and they are the easiest to restore! However, this method as also been used successfully to restore various other leather articles such as leather bags, gloves and furniture, in a wide range of colors and types of leather. Read this article from top to bottom, including notes and watch the video tutorial. Look for any dirt spots that would prevent the dye from penetrating leather. If present, see Additional information 1. For a black jacket, you simply use COSTA BRAVA black dye. But if you need to make your own custom dye color, COSTA BRAVA is available in many colors including all primary colors, white, black and clear. Mixing these, you can make any color! See color swatch here. Set up where you can freely move the jacket without spilling the dye. If needed, use tape to cover the buttons and other areas. Let’s get down to business! This method is basically in two parts (A) first you restore the leather (B) then you protect it. Put 5 ml of Lanolin (liquid Grasso) in a bowl. Shake your COSTA BRAVA dye bottle thoroughly and mix about 30 ml of COSTA BRAVA dye with the oil. Add about 30 ml of TENDERLY. Shake URAD jar thoroughly then add 30 ml of URAD. Mix well. Hang to dry for a few hours. The restoration should now be complete. If not, and this is rare, it may be necessary to apply yet another coating. Otherwise, move on to the protection step. Apply SAHARA: Preferably outdoor or in a well-ventilated area and preferably wearing a mask, spray a thin layer of Sahara on the jacket. Hang to dry for 8 hours without moving the jacket. For longer lasting result, repeat this step once. Et voila! You saved your jacket! Good job! If leather is dirty, clean it using AQUILA (*Not included in kit) leather cleaner. Spray Aquila and gently wipe. Let dry for 15 to 20 minutes. Repeat if necessary. If it is a light color jacket and there are spots with no color left at all, use COSTA BRAVA on these spots first, then clean with Aquila otherwise these spots may darken. Recipe adjustment examples (for step A.4): The leather looks too dull: Add 30 to 50 ml of URAD to add more shine. It feels stiff: Add 30 to 50 ml of TENDERLY. As you apply the restoration mix, you may come across very discolored areas. On black leather jackets for example, the color damaged spots will be visible as grayish to almost white areas. To fully restore color to these very damaged spots, you may need to apply pure COSTA BRAVA dye first, and without letting the dye dry, go over that same spot again with the restoration mixture (As shown in the video tutorial). Repairs, such as patching up a tear, can be done before restoration. However, the changing of the lining is best done after restoration. If your test (in step A.3) did not work, and the dye does not seem to penetrate the leather, you can suspect “Burned leather”. Sun, body grease, silicon and hair spray (among other things) can “burn” leather preventing the dye from properly penetrating. In that case, adding CAMOSCIO PRO (Liquid version of CAMOSCIO, not included in the restoration kit) to the dye mixture may work. It’s worth a shot because if that does not work, we know of nothing else that does. This method is not for changing the color of your leather. It is a color restoration process. This restoration process is not the regular maintenance of leather jackets. Read How to care for leather jacket article. Don’t worry if your dye color is not an exact perfect match. The color pigments will blend-in by penetrating the leather so it will not be noticeably different if it is only slightly off. Don’t forget to buy the COSTA BRAVA dye as it is not included in the Color Restoration kit. Tip: When making custom color dye, use a small amount of dye on a piece of white paper to compare to your leather. Quantity given here is for a short jacket and will vary widely from one jacket to the other depending on the type of leather and how much product it absorbs. Test on a less visible part of the article at every step of the way. Six to twelve months after the restoration is completed, you can use URAD and TENDERLY as regular conditioning and maintenance, as described in the article How to care for leather jackets? Leather is a very noble material and has incredible longevity, provided it is well cared for! Using this method, you can give a new life to your leather. It could be old and otherwise lost, it could be just slightly discolored, it could be worth thousands of dollars or have sentimental value... Either way, using these simple steps and with only minimum effort, in most cases, you will end up with your leather looking new again!